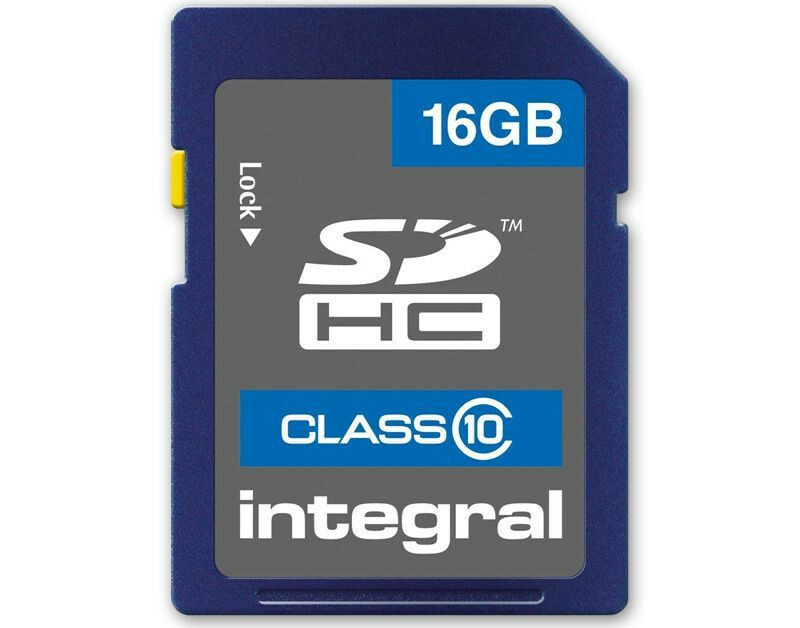 Integral's SDHC Class 10 memory cards are ideal for use in DSLR and compact digital cameras and Full HD camcorders. 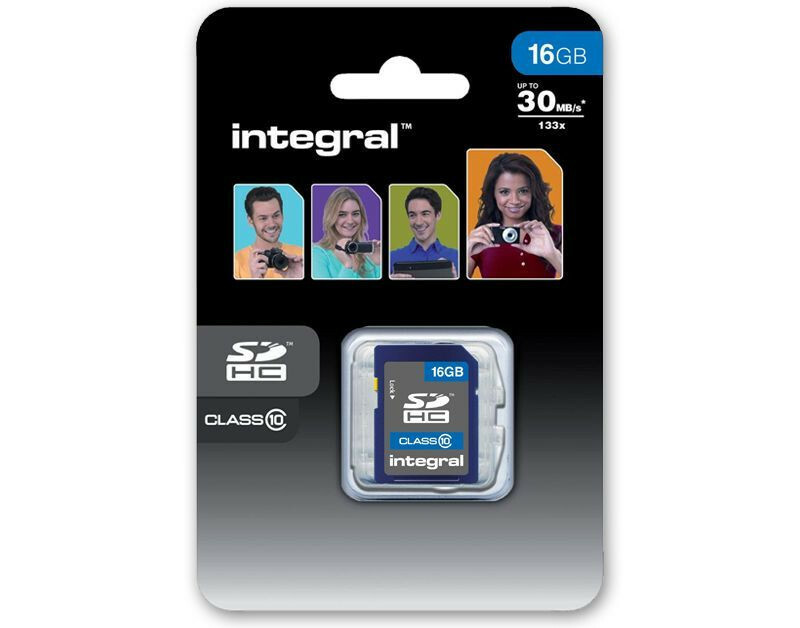 Integral SDHC Class 10 specification perform at up to 30MB/s read* and are designed to be used where fast memory cards are crucial; to capture high resolution images and to shoot Full HD video. How long will data stay valid for on a memory card ? Memory cards and USB drives are NOT designed for long term storage. You should always backup your data on to another device. The data will normally stay valid for a period of up to 10 years if stored under normal conditions. The data cells inside carry a charge which can dissipate over time. The data can be refreshed; copy all data off card and then format the card or USB drive and then restore all data to extend the data for another 10 years. My SD card is write protected - How do I unprotect it ? SD cards have a write lock. This is a switch on the side of the card. The DOWN position is write protect ON and the UP position is write protect OFF. To use the device in a camera the position of the switch must be UP. It is a good idea to write protect a card with important data. I need to reformat my memory card, which method should i use? If you are using the card in two different devices with different formats (e.g. a Digital Camera and a MP3 player) we would advise you to use two separate cards. How can I transfer the data from my memory card to my computer? To transfer data from a memory card to a PC - The PC has to recognise the memory card as a removable drive. It is good practice to back up data kept on a card. This can be done in a number of ways including. Once the memory card is recognised your can cut-and-paste or drag-and-drop data to and from the memory can as you would with any other drive. Caution: Do not remove the memory card or turn off the power whilst reading or writing data this could corrupt data. I have saved my photos back to the memory card. Why can't I view them in the camera? Most cameras will only view images stored within a set folder structure. If you have saved the images to new folders we suggest moving the images back to within the camera's folder structure and you should be able to view them. If you have modified the original image or changed the file format using Adobe Photoshop or similar the image may now not be compatible with your camera's operating system and so will not display on the camera's viewing screen (the images will be perfectly safe and fine to print). To avoid problems it is best not to save changed images back to the memory card if possible. If memory cards are reusable, why would I ever need more than one card? • Use an extra card when it is impractical to download your pictures, e.g. on holiday, or on the move. • It is sensible to set your camera to at the highest resolution (and therefore highest quality) setting. However, higher resolution images require more space, so with only one memory card you risk running out of storage space quickly. With an extra memory card this problem is eliminated. • Many modern digital cameras also record high quality video. These video clips use produce a lot of data, so a single memory card can become full very quicky. • Take more shots of your subject and select the best one without having to delete unwanted images straight away. • What if your only memory card gets lost or damaged? Precious holiday, birthday, wedding photos could be lost forever! Spread the risk by using 2 or 3 memory cards with your camera. After using a memory card for some time I have noticed I can no longer save the same number of images to the card. Is it faulty? The memory card is not faulty. This is an occasional issue that can happen after a long period of use. • Some cameras when formatting the memory card create multiple File Allocation Tables FAT). If the camera has formatted the card a number times the space used by these tables will have increased and therefore the available space for saving images will have been reduced. • To fix this, use a card reader to reformat the memory card to FAT32. Remember to have downloaded and backed up any images you wish to keep before formatting, as this will destroy all data saved on the card. Why do digital memory cards sometimes become “unreadable” or “unprintable”? This problem is not related to any particular brand of memory card or device. It can occur when the device had been interrupted when accessing the memory card. • DO NOT turn OFF the device or remove the memory card while the device is reading, writing, erasing or formatting. • DO NOT use the device while the batteries are low. This could result in corruption. In some cases power can run out as the memory card is being written to. • AVOID inserting and removing the memory card with the device switched ON. • To fix this problem you will need to reformat the memory card (this will destroy all data held on the card). • You may be able to recover images from a corrupted memory card (see FAQ on reformatting the memory card). • Some cameras will not access memory cards that have been formatted in a Card Reader, so please read your camera manual before proceeding with a format. • When using card readers make sure the readers light is not flashing and wait a few seconds before pulling the card out of the card reader slot. How can I recover pictures from a memory card that has become unreadable? If a card has become unreadable, DO NOT format the card if there is data on the card you wish to recover. If corrupt data has been written to a card, it still may be possible to retrieve data/images from the card. In many occasions it is possible to use Data Recovery software to recover images or data from a memory card/USB Flash Drive that is no longer readable. • We have used "Photorescue" from Datarescue. • There is a demo version for download that will show you if it can recover your images before you need to purchase the software. What is the difference between SDHC and SD Cards? SDHC (Secure Digital High Capacity) was established to meet the growing demand for HD (High Definition) video and high resolution image recording now used in many SD-enabled devices. SDHC is the same physical size and shape as standard SD but meets the new SD specification of version 2.0. If the SD card is 4GB or above, it is classed as a SDHC card. Currently, SDHC specifications allow for memory cards of a capacity between 4GB and 32GB. * The minimum speed capability depends on the manufacturer of the host device and model. 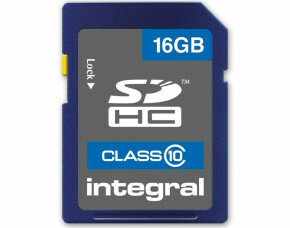 All Class 2, Class 4, Class 6 and Class 10 SDHC cards are compatible with SDHC devices. Please note that if the device manual suggests a SDHC card of speed Class 4 as a minimum, the user should install a Class 4, Class 6 or Class 10 (faster) SDHC, NOT a Class 2 card as this may reduce performance of the device. SDHC cards are not backwards compatible with standard SD devices, so they may not work in digital cameras or USB Memory Card Readers manufactured before summer 2007. Most new devices that require the new SDHC format to operate will display the SDHC logo on the product (such as printed on the side of a camera casing) and/or user guide. Standard SD Cards will work in SDHC compatible devices such as Memory Card Readers. In a SDHC camera a standard SD may be of limited use due to the slower read and write speed of this older technology. The information contained in this FAQ also applies to microSD and new microSDHC plus miniSD and new miniSDHC formats. The only difference will be the physical size of the memory cards, the speed class information and compatibility issues are the same. What is the SDHC minimum guaranteed speed? The SDHC Specifications sets a minimum guaranteed speed of 2, 4, 6 or 10MB/s to match a host device. This speed rating is commonly referred to as Class 2, Class 4, Class 6 and Class 10 speed. This rating system was introduced to satisfy the needs of High Definition digital cameras and camcorders, where a guaranteed continuous write speed is more important than the maximum write speed which is affected by many variables. My device does not recognise my Integral memory card. What is wrong? 1. Make sure the memory card is not inserted upside down, this is a very common issue with memory cards in mobile phone handsets. 2. Try rebooting/switching on your device with the memory card already inserted. 3. Is your device SDHC / miniSDHC / microSDHC compatible? - many cameras, PDA's, mobile phone handsets and built-in card readers (on a PC) produced before Summer 2007 will not work with SDHC memory cards. What is the difference between SLC and MLC flash memory chips? Most flash products on the market utilize NAND flash memory which can be sub-divided into two categories, SLC and MLC. MLCis by far is the most popular because it has a lower cost. • SLC (Single Level Cell) products store only one data bit per NAND flash cell which leads to faster transfer speeds, higher cell endurance and a lower power consumption. The only downside to SLC chips is the manufacturing cost per Megabyte. SLCs are intended for the high-end consumer and server market and they have approximately 10 times more endurance compared to MLCs. • MLC (Multi Level Cell) store two or more bits per NAND flash cell. Storing more bits per cell achieves a higher capacity and lower manufacturing cost per Megabyte. MLC products are designed for the mainstream consumer market. What is a SDXC card ? SDXC is the latest type of memory card released in 2010 which meets the demands of FULL HD recording in terms of capacity and speed. The SDXC card has the same dimensions of a SD and SDHC card, but is ONLY compatible with SDXC devices. SDXC uses the exFAT file system to handle large data volumes and files sizes over 4GB. A microSDXC version is in the pipeline.